Today's tiara received a fair bit of attention during our round up last week of tiaras which venture beyond standard featured stones. And this is very much an interesting and uncommon stone for a tiara: peridot, a green option with a range of shades from rather pale and watery to an intense olive or even lime green. These particular peridots are quite fine, with good purity, huge size, and a deep olive color. There are five peridot stones in the tiara, each surrounded by a scrolling foliate diamond frame. The tiara is part of a parure which includes a set of earrings, a large brooch (or devant de corsage), and a necklace; the necklace includes seven drops which can be removed and mounted upright on the tiara. The tiara dates from the 1820s and is attributed to Kochert, court jeweler to the sprawling Habsburg family in Austria. It's said to have originally been made for Princess Henrietta of Nassau-Weilburg (1797-1829), who was the wife of Archduke Charles, Duke of Teschen. 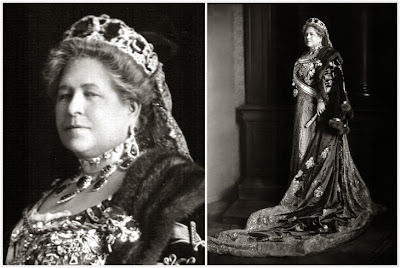 But the tiara is most strongly associated with Princess Isabella of Croÿ (1856-1931), who married Archduke Friedrich, grandson of Henrietta and Charles and a successor to the Duke of Teschen title. It is on Archduchess Isabella that we have our first evidence of the tiara in use. The parure has been through a few sales since Archduchess Isabella's time. The first came after the 1936 death of her husband, Archduke Friedrich; in 1937, the set was sold to Count Johannes Coudenhove-Kalergi (1893-1965) and his wife Countess Lilly. The jewels ended up in the United States, eventually passing to their daughter, Marina. Countess Marina lived a life apart from her noble roots, and the jewels stayed tucked away inconspicously in a bank safety deposit box for decades. When she died in 2000, her estate administrators were shocked to find that the jewels from her mother she had mentioned turned out to be this exquisite set with royal provenance, as verified by Sotheby's. 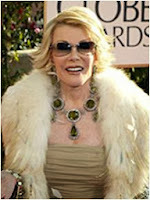 The jewels were auctioned by Sotheby's in 2001 and sold for around $400,000. They were bought by Fred Leighton, the jewelry firm well known for its celebrity connections, and the necklace and earrings were later loaned out to comedian and TV personality Joan Rivers for the 2004 Golden Globes ceremony. At some point, at least a part of the set was purchased by Lily Safra, as the earrings and brooch were placed on auction yet again in May 2012 when a selection of jewels from the philanthropist's collection were sold by Christie's for charity. I don't believe the whereabouts of the necklace and tiara are publicly known today. 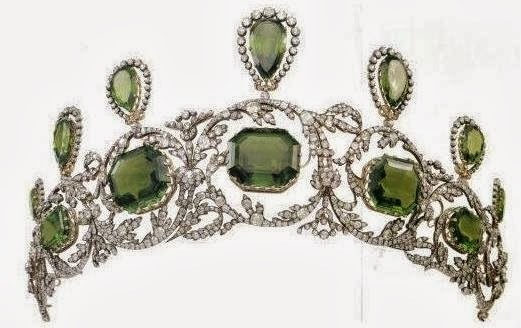 I'm not a big fan of peridot - these just aren't my favorite shades of green - but I do love seeing a tiara that makes an unusual stone choice. I love the variety, and I wish we saw more of such things on today's royal ladies. 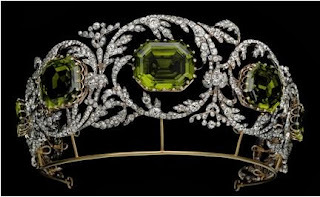 Peridot tiaras: yes or no?